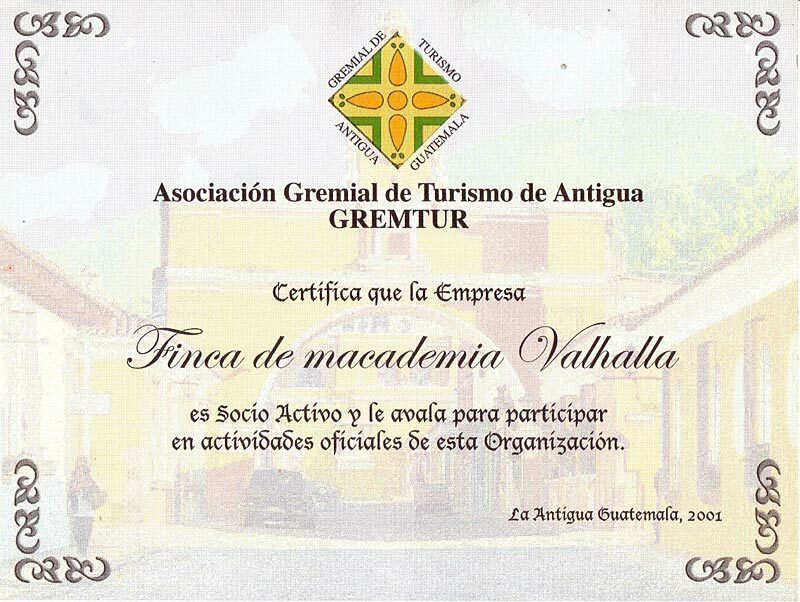 The Valhalla Project is a Guatemala based organization that seeks to reverse global warming, assist indigenous people in developing self-sustaining agriculture, and educate the public about the environment. We accomplish this mission by planting trees. The Valhalla project introduces ungrafted Macadamia seedlings to indigenous people as an alternative to slash and burn agriculture, which contributes to global warming. 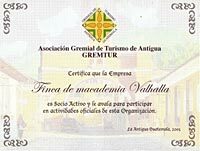 The Valhalla Experimental Station was awarded the International Human Rights Consortium medal in the category of environment August 3rd, 2004 in Victoria Hall, Geneva. In 1972, Lawrence Gottschamer was retired in the line of duty as a Fireman in Redwood City, CA, prior to serving in the army during the Viet Nam war. In 1975 he was asked to go to Costa Rica to farm 100 acres of macadamia nut trees. His mentor at that time, Mr. Edelberto Camacho, from the Instituto Interamericano de Ciencias Agricolas in Turrialba, Costa Rica, was and is still well known in the industry. He spent countless hours in private consultation with Mr. Camacho and numerous other professors discussing all phases of agriculture particularly the macadamia tree. While in Costa Rica, Lawrence started the first private nursery in Turrialba. In Costa Rica, he had the chance to meet with experts coming from Hawaii, as the Costa Rican macadamia industry was modeled using Hawaiian methods. As it turned out, the macadamia agro-industry in Costa Rica fell short of commercial expectations because conventional Hawaiian clones were used in the plantations. It was always apparent to Lawrence Gottschamer that locally developed varieties adapted to local climate work much better. When Lawrence Gottschamer finished his work in Costa Rica he decided to go to Guatemala, where he could continue his work with macadamia. He built several small macadamia-processing plants for the private sector, and was one of the founders of "Voit, Juarez, and Gottschamer, Consultants" an agro-industrial consulting company. During that time he met his wife, Emilia Aguirre who shared his passion for the environment. 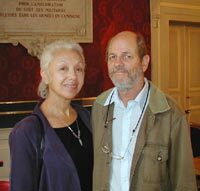 They married and since that time have been working together for the preservation of the environment. In 1984 they inherited one of the best gene pools of macadamia from the California Macadamia Society, which was considered to be one of the most advanced gene pool of macadamia in its day. Initial studies began at that time to try and develop a macadamia tree that did not need to be grafted. In 1985 Lawrence and Emilia founded the Experimental Station Valhalla. Its pursuits were and continue to be ecological. With the gene bank in hand they pursued a genetically diverse high carbon dioxide and water exchange capacity tree which is competitive and superior to the grafted or cloned trees available at that time. Their purpose was to use the technology to provide the indigenous communities with a substitute for their current practices of slash and burn agriculture. Finally there was proof that there is a tremendous future for the private sector in the eco-development industry. At Valhalla, they have developed seedling trees whose economic performance is considered at least as good as the best of today's grafted material. "Lets make planet earth our church, and protecting it will be our religion." This memo is written to personalize and support Larry Gottschamer's incredibly important and successful Macadamia enterprise. I have been involved in humanitarian service in countries in Latin America and in Africa since 1976. I went through the traditional PhD plant breeding and genetics program at the University of Minnesota. I worked for 12 years at the University of Nebraska and then to Brigham Young University in 1971. I loved teaching and conducting research with bright, enthusiastic students but felt a great desire to try do something that would help genuinely change the subsistence families in other countries to families of self sufficiency. That effort was very successful but it's recitation is not the reason for this document. The projects we conducted in Guatemala led me to Larry and Macadamia. We were working with the people in the same circumstances but in different areas. I cannot stress enough how impressed I was with the Macadamia program. It is a program that gets immediately to the heart of several humanitarian and environmental issues. There must be a way found to keep people on the land. Moving into congested urban areas is a disaster socially and in some ways is dehumanizing. But for people to stay on the land they must have a program which generates income and lifts them out of poverty and subsistence. Macadamia has the potential to do that. More corn will not. Markets can and must be generated for products utilizing the unique qualities of this remarkable plant. There are products that can be marketed locally and which are as good as the best in the world. The environmental benefit of Macadamia is as old as trees. Trees are the great environmental cleansers and moderators, a fact which seems to be little understood or appreciated. In Macadamia these benefits are combined with a fruit (nut) that has qualities for food and oil products unique to Macadamia and which can be utilized by people in a number of ways. The problem is to produce the trees and then get them to the subsistence farmers. Larry has not followed conventional wisdom in producing his Macadamia but he has been very successful. As a plant breeder/geneticist I admire what he has done. He has utilized a very simple system of competition and selection based of vigor and hardiness. He has kept the genetic system open by not cloning and has developed trees which mature to nut bearing age in half the time and in addition produce considerably more nuts per tree. Over the life time of a tree this amounts to a phenomenal improvement on revenue potential. The impact on the environment is measured in terms of temperature reduction, soil erosion control and vegetation diversity which will stabilize the natural ecosystem. I realize in writing this I am sounding very pro Larry Gottschamer. I don't apologize for that because I believe in what he has done and is doing. I believe in the great potential to make significant changes in the lives of the people he serves. Any financial help given to promote this program is funding well spent on humanity. I certainly recommend to you the great service he is giving.